Explanation: Welcome to The World At Night. 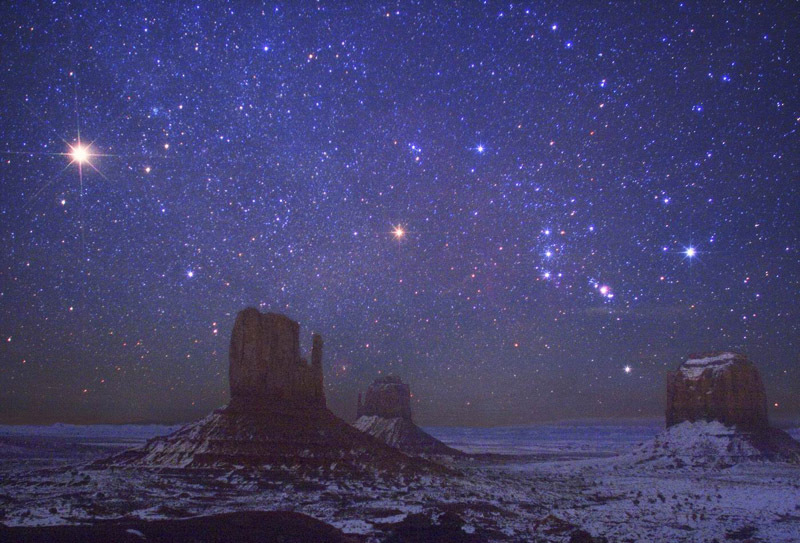 Sharing the night sky seen around the world, this view from Monument Valley, USA includes a picturesque foreground of famous buttes. Buttes are composed of hard rock left behind after water eroded away the surrounding soft rock. The two buttes on the image left are known as the Mittens, while Merrick Butte is on the right. Recorded just last week, planet Mars is at the left of the skyscape, a glowing beacon of orange that is the brightest object in the frame. To the right of Mars lies the constellation of Orion. Betelgeuse is the reddish star near the center and the Belt of Orion and the Orion Nebula are farther right. Finally, the bright blue star Rigel appears above Merrick Butte in this stunning view of The World At Night.